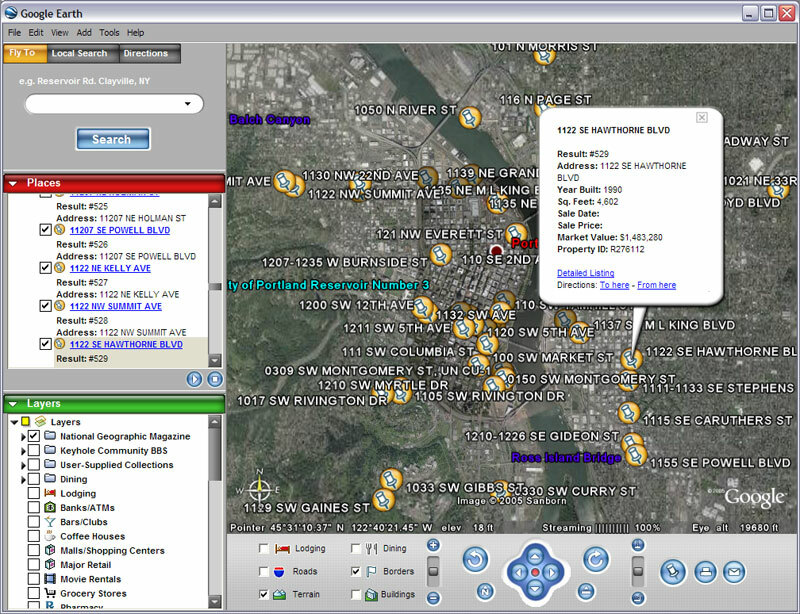 I had posted about the Portland Maps Advanced Search last week and how it integrated Google Maps into the user interface to allow users to see where their results were located before going to more detailed mapping of each site. Richard Davies just posted to let us know that he’s gotten the export to Google Earth working and now your results can be view in the Google Earth application. Go ahead and search using the Portland Maps Advanced Search tool. When the results are return, you’ll see a little Google Earth KML icon in the lower left portion of the page. Just click on that to download the KML file into your Google Earth. This is really slick, compared to most municipal web mapping sites, Portland really has their ducks in a row with the latest technology. Great job guys!